Although the Breton Language looses ten thousands of speakers every year, Breton poetry is alive and interesting. 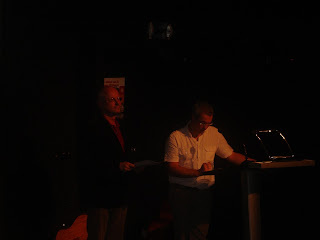 Olivier Cousin was representing them at our Small Festival of European Art of Poetry., last September. When he and Bart Stouten met it was as if two long lost brothers met and found each other. They obviously share a poetic sensitivity. So Bart had a wonderful program in The Garden of Eden on Klara with Olivier, read the dutch translations of Paul Gellings and interviewed Olivier about poetry in Breton and the regional poets. The music was wonderful and the program was sensitive and interesting. Here you see Olivier and Paul reading together.